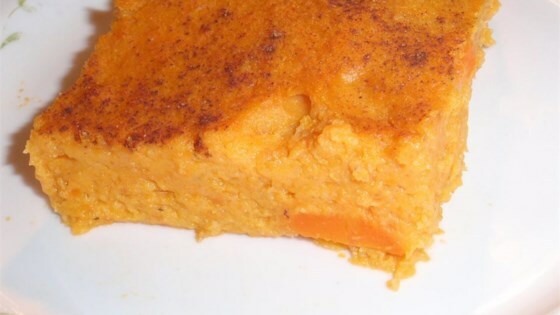 "Carrots and sugar sweeten the turnip in this side dish. A must for my family's Thanksgiving and Christmas dinners. The recipe is often requested." Preheat an oven to 350 degrees F (175 degrees C). Grease a 2 quart casserole dish. Place the carrot and turnip cubes into a large pot and cover with salted water. Bring to a boil over high heat, then reduce heat to medium-low, cover, and simmer until tender, about 20 minutes. Drain and allow to steam dry for a minute or two. Return the carrots and turnips to the pot, and mash well with the butter, salt, flour and 1/4 cup of sugar. Whisk together the eggs and milk in a bowl, then stir into the mashed carrot mixture until blended. Scrape into the prepared casserole dish. Stir together 2 tablespoons of sugar with the cinnamon in a small bowl, and sprinkle over the top of the carrot mash. Bake in the preheated oven until the carrot mash has slightly firmed and the top has begun to turn golden brown, about 45 minutes. This was just ok for me. I didn't care for the cinnamon topping and even with the addition of the eggs, the casserole was not firm enough for me. Tira shared this family recipe with me and I made it for Thanksgiving this year and it was a HIT!! So yummy, perfect addition to my table!! Thank you!! This is a great use of turnip ! As I usually do, I added an apple,onion & garlic ( sateed in butter .) It added a depth to the dish that turned out great ! This is a really good recipe. I did not have any turnips, but I had parsnips so I used that instead. Only other change was to reduce the amount of sugar on top to 1 Tbsp.